Most cyclists are eager to suffer through sprints, lactate threshold intervals or VOmax efforts—but few are enthused about working on pedaling technique. Perhaps it's because doing heart-pounding, leg-searing efforts feels like you're making a difference in your fitness. In the back of your mind, you know these efforts and feelings will surely be repeated on race day. But pedaling technique? B-O-R-I-N-G. Pedaling with one leg, doesn't feel like you are building fitness. It's just not hard enough. I've said this many times before: anyone can ride hard—not everyone can ride fast. The most effective use of force during movement, to create power, depends on not only the strength of the muscles involved, but also on a series of coordinated neuromuscular patterns. In short, you need to move efficiently. Think of what a child looks like as they learn to ride a bicycle for the first time. The motions are jerky, the bike is weaving back and forth and the child is putting a lot of energy in keeping the bicycle upright and moving forward. That visual is an extreme example of muscles not working in a coordinated effort to move the bicycle forward. Certainly, a child lacks the muscular strength and endurance to pedal a bicycle for any distance when they begin riding. Another visual example to illustrate the point is to consider that experienced cyclists have very strong legs and good endurance. Ask an experienced cyclist to figure skate and likely you'd witness a muscular and strong athlete struggle to move across the ice, let alone complete complex skating maneuvers. Laboring to simply make it around the rink multiple times, a jerking, tentative cyclist would likely be exhausted in a very short time. Take the experienced, muscular skater that can spend hours gliding about the ice, completing complex moves and put them on a bicycle. In short time, relative to their time spent in a skating workout, that skater would be exhausted. Of course this assumes the skater does no cross-training as a cyclist. If you want to excel at cycling, you need to possess many aspects of fitness. One of the aspects is efficient movement. If you train your body to move in a pattern that is efficient for your sport, in this case cycling, you can improve race day performance. Though your current form inefficiencies may not be as gross as a new cyclist, perhaps doing some fine-tuning now can help your summer riding season. 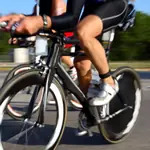 In this column, I offer you a few drills to help improve your neuromuscular patterns for cycling with the goal of improved performance. This workout helps work the dead spot out of your pedal stroke. After a warm-up, with light resistance on an indoor trainer, do 100 percent of the work with one leg while the other leg is resting on a stool. The bottom of the stroke is similar to the motion of scraping mud off the bottom of your shoe. The top of the stroke can be improved by driving your toes and knees forward. In all positions, keep the toes relaxed. Do not allow them to curl-up and clinch the bottom of your shoe.